The UN high commissioner for human rights Zeid Ra’ad Al Hussein said he was grief-stricken. Ghanaian President Nana Akufo-Addo declared a week of mourning, saying the national flag will fly at half-mast at home and in the country’s diplomatic missions around the world in honour of “one of our greatest compatriots”. “He brought considerable renown to our country by this position and through his conduct and comportment in the global arena,” the president said in a statement. South Africa’s ruling African National Congress (ANC) said Annan was “an eminent and distinguished son of Africa”. “Annan was a great friend of the people of South Africa who played an immeasurable role in shaping the global agenda in favour of the people of the developing south,” the ANC said in a statement. British Prime Minister Theresa May said her “thoughts and condolences are with his family”. “A great leader and reformer of the UN, he made a huge contribution to making the world he has left a better place than the one he was born into,” she said on Twitter. Spain’s Prime Minister Pedro Sanchez said that “today we lose a great humanist”. “Annan… has left us but his legacy remains to keep working for peace, security and to strengthen the defence of human rights,” Sanchez tweeted. “His warmth should never be mistaken for weakness. Annan showed that one can be a great humanitarian and a strong leader at the same time,” Stoltenberg wrote on Twitter. 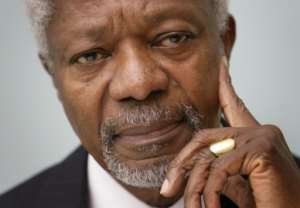 EU Commissioner for International Cooperation and Development Neven Mimica said he was “profoundly saddened” by Annan’s death. “He was such a great source of inspiration for all of us and will be greatly missed!” he tweeted. The Elders organisation — a group of statesmen co-founded by Annan which speaks out on global issues — hailed the former UN chief as “a voice of great authority and wisdom in public and private”. “The world has lost an inspiring figure — but one whose achievements will never be forgotten, and whose commitment to peace and justice will endure to inspire future generations,” deputy chair Gro Harlem Brundtland said in a statement.